PCE Instruments’ temperature meter products are precise, portable, handheld devices ideal for professional, industrial, commercial and residential use. From contact temperature meter devices with probes to noncontact temperature meter devices using infrared or laser technology to measure temperature from a distance, PCE Instruments offers a wide range of accurate, reliable temperature meter products at an affordable price. Temperature is measured and recorded in many different applications. 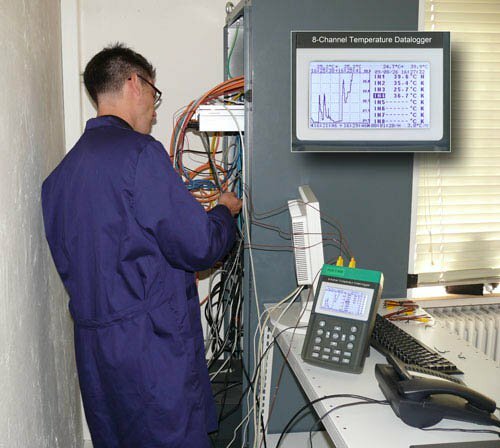 For example, HVAC technicians measure temperature to identify and address issues in heating or cooling systems, while quality control professionals in the food sector measure temperature to ensure the proper storage and preparation of everything from meat and produce to cheese and frozen foods. 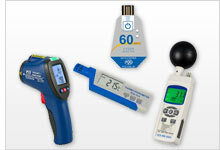 PCE Instruments carries a variety of temperature meter products, including temperature meter devices to measure different temperature ranges between -200 and 1767ºC; temperature meter devices that can indicate temperature in °C (Celsius), °K (Kelvin) and °F (Fahrenheit); and temperature meter devices that are water resistant. In addition, a number of thermal elements and type-K sensors are available for different temperature meter products. Each temperature meter comes factory calibrated to ensure accurate measurement. ISO-certified calibration, performed by one of our first-class calibration laboratory partners, may be obtained on most temperature meter models for an additional fee. A temperature meter is an instrument used to measure the temperature of beings or things. The most widely recognized temperature meter is a mercury thermometer used to measure the temperature of people. These thermometers consist of a graduated glass capillary with a pool of mercury in one end. However, there are many different types of temperature meters, such as digital thermometers that take temperature measurements on contact with an object or infrared temperature meters that take measurements at distance, without contact. The temperature meter PCE-VDL 16I from PCE Instruments measures and stores the relevant measured variables: temperature, relative humidity, air pressure, light as well as acceleration in three axes by means of a vibration sensor. Therefore, this temperature meter is ideal for monitoring vibrations on machines while simultaneously measuring and recording the relevant environmental conditions of the system. The PCE-T390 temperature meter is a digital device with four input channels for type K and type J temperature sensors and two input channels for PT100 temperature sensors. The PCE-T390 temperature meter has a SD card slot (from 1 ... 16 GB) for storing the measured data. The data is stored in xls format on the SD card of the temperature meter so that no additional software is needed for further analysis. The Temperature Meter PCE-777N measures non-destructively and from a distance, the temperature of surfaces via infrared beam. This small temperature meter is characterized by simple operation and the red sighting tool. The temperature meter PCE-666 is a combined thermometer which can measure with or without contact. The temperature meter is equipped with a measuring tip and a measuring clamp. As soon as the measuring tip is unfolded, it will start a temperature measurement automatically. If this is not the case, the measuring clamp will be used for the measurement. With the PCE-890U temperature meter, measurements of surface temperatures can be carried out quickly and easily. Since the temperature meter uses infrared radiation for temperature measurement, no direct contact with the measuring object is required. The PCE-890U temperature meter makes it easy to measure objects from a distance that are difficult to access. The Temperature Meter PCE-TC 28 was designed for taking non-contact temperature measurements. To get accurate readings, the emissivity of the temperature meter can be adjusted, depending on the operation purpose. Besides taking infrared images, the temperature meter can also take normal pictures, as well as a mixture of both, due to the built-in digital camera. PCE-TC 29 is a non-contact IR temperature meter imaging camera used for visual inspection and non-contact infrared (IR) temperature measurement. Ideal for industrial use in electrical, mechanical, and building installations (such as in the auditing of machines, engines, or heating, ventilation, and air conditioning (HVAC) systems), this affordable infrared imager captures and saves 60 x 60 pixel IR resolution images to the included MicroSD card memory. The PCE-778 is a temperature measuring device which can measure from a distance. This contactless measurement with the infrared temperature meter is suitable for temperatures up to 800°C / 1472°F. Thus, distances can be overcome, in which the temperature for the human body is too high. The temperature meter PCE-778 is an infrared laser thermometer that can be used in the food industry, for the prevention of fires of all kind, in the chemical industry, and in the storage and transportation industry. The temperature meter has several useful features, including the extreme value (Maximum / Minimum), the HOLD, the mean measurement, differential measurement, and alarm (high / low) functions. The temperature meter with microprocessor is a high precision 1-channel temperature gauge. The temperature meter with microprocessor is ideal for use with various Pt100 sensors. Due to the fact that it uses 4-wire technology, it has a very fast response time and precision. Each temperature meter comes manufacturer calibrated and can be certified according to the ISO standards as an option. PCE-ITF 10 is a portable handheld infrared temperature gun meter, thermometer or laser pyrometer that uses an infrared (IR) sensor to measure temperature in degrees Celsius (°C) or Fahrenheit (°F) without contact. This non-contact IR temperature meter can be used to detect leaks in walls, ducts, ventilation systems and more. The PCE-JR-911 temperature meter with Thermometer is a versatile tool in that it can measure the temperature of objects without contact and readings can be stored in memory and transferred to a computer by way of its RS-232 interface and software. This temperature meter comes complete with a Thermometer, allowing the user to program specific time intervals for taking measurements, such as over an entire week. Each temperature meter comes manufacturer calibrated and can be certified according to the ISO standards as an option. PCE-IR 100 is both an infrared non-contact thermometer for measuring surface temperature and a contact thermometer with probe for measuring core temperature of food. This food-grade thermometer allows for quick and easy testing of food surface temperatures without contamination using the infrared sensor, while also offering the possibility of testing food internal temperatures using the food-quality sensor probe. The temperature meter is suitable for private and industrial use because of its price-performance ratio. An infrared temperature meter is a contactless measuring device. The bright laser dots from infrared instruments are clearly visible and provide easier temperature measurement from a distance. The PCE-779N measures temperatures quickly and without contact. The PCE-779N can be used for almost all surfaces. The emissivity of the Temperature Meter is adjustable over the range of 0.1 ... 1.0. The Temperature Meter has various measurement functions such as max, min and average measurement. Each temperature meter comes manufacturer calibrated and can be certified according to the ISO standards as an option. In general our laboratory adjusts the temperature meter to two (linear) temperature points. The Air and Temperature Meter PCE-VA 11 is an extensively used measuring instrument. This temperature meter offers the opportunity to determine air speeds, air temperature and infrared temperature. The illuminated LCD allows comfortable readings and facilitates use in dimly lit areas. The dual infrared temperature meter is used for fast surface temperature measurement. The two laser points of the infrared temperature meter PCE-895 mark the exact measuring point and thus offer excellent assistance with the temperature measurement. PCE-TC 34 is an IR imaging temperature meter or thermal imager camera used for visual inspection and non-contact infrared (IR) temperature measurement. Ideal for industrial use in electrical, mechanical, and building installations (such as in the auditing of machines, engines, or heating, ventilation, and air conditioning (HVAC) systems), this high-definition, high-resolution thermal imager captures and saves 640 x 480 pixel IR resolution images to the included SD card memory at a refresh rate of 50 Hz. 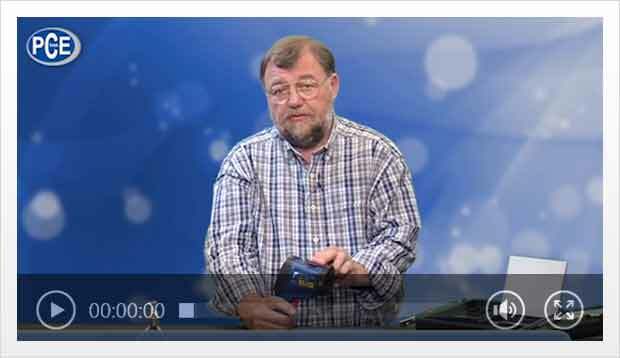 Temperature meters are instruments we use to measure the temperature of people or things. The most used and known thermometers are mercury thermometers used to measure peoples temperature and consisting of a graduated glass capillary and a pool of mercury in one end, but there are many types of thermometers such as digital thermometers that we have introduced which take temperature measurements on contact with an object these are suitable for any sector of industry. We even have infrared or laser thermometers to take measurements at distance, without contact. Temperature is a quality that refers to the cold or hot common concept. When an object is hotter it is because it has a higher temperature. The temperature increase is due to the degree of agitation of the materials particles, so the greater agitation, the higher temperature. So we can say that the temperature depends on the movement of the molecules that a substance is composed of. If these have more or less movement, there will be a higher or lower temperature, respectively. Thermometers are devices for measuring temperature and these have changed since their invention considerably. At first thermometers were based on the principle of expansion. For this type of thermometer you need a material with a high coefficient of expansion, so that as the temperature increases, the expansion of the material is easily visible. The material used for this type of thermometer is mercury, enclosed in a glass tube that has incorporated within it a graduated scale. Today these kind of thermometers have been banned due to the polluting effect of mercury which is quite high. These models of thermometers can display the measurement of Celsius, Fahrenheit or Kelvin. In the international system of units, the SI temperature unit is Kelvin which can be compared directly to Celsius where 0 °Kelvin = -273.15 °C and 0 °C = 273.15 °Kelvin. First we can distinguish, so to speak, two categories in the measurement units for temperature: absolute and relative. Absolutes are those which start from absolute zero, which is the lowest theoretical possible temperature and corresponds to the point in which molecules and atoms of a system have the minimum possible thermal energy and are not agitated at all. Kelvin (international system): is represented by the letter K and has no grade symbol "°" . It was created by William Thomson, on the basis of Celsius degrees, thus setting the zero point at the absolute zero (-273.15 °C) and keeping the same dimension for grades. It was established in the units' international system in 1954. Relatives are compared to established physical-chemical processes that always occur at the same temperature such as freezing point of nitrogen. Celsius Degrees (international system): or also called degree centigrade, is represented by the symbol °C. This unit of measure is defined by choosing the freezing point of water at 0° degrees and the boiling point of water at 100 °, both measurements into a pressure atmosphere , and dividing the scale into 100 equal parts in which each one corresponds to 1 degree . This scale was proposed by Anders Celsius in 1742, a Swedish astronomer physicist. Fahrenheit Degrees (international system): this takes divisions between freezing points and evaporation of solutions of ammonium chloride. So by the proposal of Gabriel Fahrenheit in 1724, he set zero and one hundred in freezing temperatures and evaporation of ammonium chloride in water. It uses a mercury thermometer by means of introducing a mix of crushed ice with ammonium chloride in equal parts. At the time, the concentrated salt solution was the lowest possible temperature in the laboratory. Then he made another mix of crushed ice and pure water, which determines the point 30 °F, then setting at 32 °F (melting ice) and then thermometers are exposed to steam of boiling water and gets the point 212 °F (boiling point of water). The difference between the two points is 180 °F, divided into 180 equal parts determines the Fahrenheit degree. Because of this combination of International units of measure the PCE-T395 thermometers can measure in Celsius or Fahrenheit to accomodate for all situations.